One-Two Punch: Who Did More Damage to the US Economy, Greenspan or Rubin? 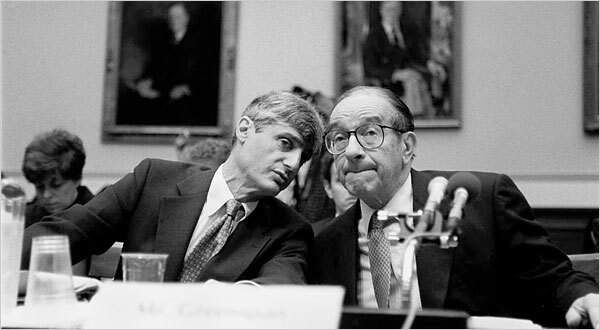 Four years ago today, Peter Goodman of the NYT published this article about former Fed Chair Alan Greenspan, titled Taking Hard New Look at a Greenspan Legacy. “One prominent financial figure, however, has long thought otherwise. And his views held the greatest sway in debates about the regulation and use of derivatives — exotic contracts that promised to protect investors from losses, thereby stimulating riskier practices that led to the financial crisis. For more than a decade, the former Federal Reserv Chairman Alan Greenspan has fiercely objected whenever derivatives have come under scrutiny in Congress or on Wall Street. “What we have found over the years in the marketplace is that derivatives have been an extraordinarily useful vehicle to transfer risk from those who shouldn’t be taking it to those who are willing to and are capable of doing so,” Mr. Greenspan told the Senate Banking Committee in 2003. “We think it would be a mistake” to more deeply regulate the contracts, he added. The whole article is worth reading. It reflects the early days of the unraveling of the Maestro’s reputation, whose fall from grace accelerated as the crisis wound on. Today, it lay in ruins, where it deserves to be. Few men have wrought more economic damage in the misguided pursuit of a bad economic idea then former Fed Chief Alan Greenspan. No, as it turns out, neither Banks nor Markets can regulate themselves . . .